Tucked away in a narrow, three tier shop on Camden Passage hides SMUG: a treasure trove of interior decor, jewellery and stationery founded by Lizzie Evans. Inspired by her childhood experiences of spending pocket money around Islington, Lizzie bought, renovated, branded and launched her shop entirely under her own steam, carefully carefully building and refining the brand over the last seven years since its birth. Now, for the first time, Lizzie is ready to announce her first self-designed collection: Lizzie for SMUG. The shop has long championed the work of other designers, stocking products from little-known sellers from London, across the UK and around the world. Lizzie has also explored exclusive collections via collaborations with other creatives via the Exclusively 4 SMUG series, which has seen talented people create one-off designs for Lizzie to sell in her shop. Now, in an enviable position as the main organiser and central meeting point for Islington's Design District (a new section to the broader London Design Festival), the time has finally come for Lizzie to take the leap into designing her own stuff. It was always the plan to produce some of my own work to complement the products that I curate at SMUG. I’ve been able to put lots of energy into the creative outlets I have when it comes to styling the shop and the brand as a whole, but now seemed like the right time to knuckle under and get designing. There are five patterns in the collection (clockwise from top left above): Life Drawing, Cascade, Splatter, Patio and Greenhouse (my favourite). 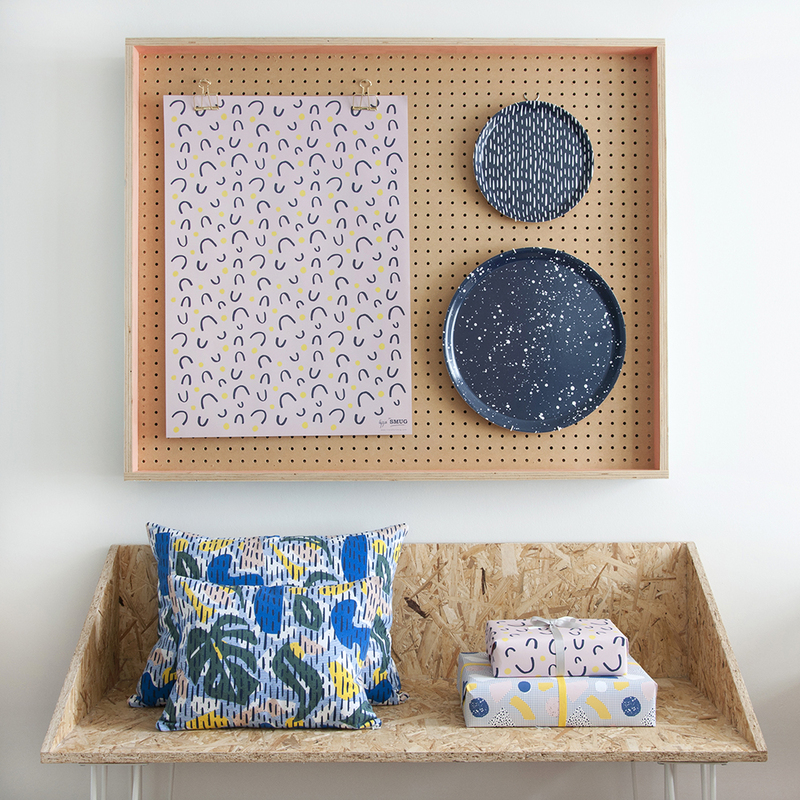 The designs will be brought to life as a range of cushions, trays, purses, wrapping paper and tote bags, so you can splash your favourite all over your house, desk or person as you please! It’s the beginning of something really new and exciting for me as a designer. I hope I’ve come up with an illustrative voice for this collection that is something fresh and different, that shows you more of who I am, but that clearly comes out of what SMUG is and continues to be. Lizzie launched her collection at London Design Festival in September and the first products are now starting to appear in her webshop. Check out what's in stock online, or pop into her store on Camden Passage to see them in person and say hello! All images courtesy of SMUG.